I was recently blessed with an amazing trip: I journeyed to Rome for the Easter Triduum and for the Vatican Forum of C.A.L.L., the Catholic Association of Latino Leaders, founded by Archbishop José H. Gomez to be a voice for issues important to the Church and to Latinos in the US. Our Vatican Forum afforded us some unprecedented opportunities: from the privilege of lodging where cardinals and bishops lodge, to the immense privilege of dialoguing with high-ranking Vatican officials. Several of them assured us that the appointment of our Founder and Episcopal Moderator as coadjutor archbishop of Los Angeles (while we were in Rome!) is a clear sign that the Holy Father appreciates the presence and contributions of Hispanics, the fastest growing and largest “minority” in the Church in the US. We began with the Papal Audience at St. Peter’s Square where I stood just six feet from the Pope who looked right at me as I called his name! 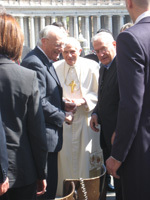 Our Forum included meetings at the Pontifical Councils for Social Communications, for the Laity, for Justice and Peace, and for the Pastoral Care of Migrants and Itinerant People, as well as at the Pontifical Commission for Latin America, the Secretariat of State, the General Secretariat of the Synod of Bishops, and the US Embassy to the Holy See. We celebrated daily Mass at some of the most amazing churches in all of Christendom, toured St. Peter’s Basilica, and were brought to a rooftop for a magnificent view of St. Peter’s Square, the papal apartments, and the city of Rome. Oh, the unmerited privilege of being in such high places! Before the meetings, I took a two-day prayer escapade to Assisi and prayed at the tombs of Saints Francis and Clare, in front of the San Damiano Cross from which Jesus asked St. Francis to “rebuild my church”, and at the Basilica of Our Lady of the Angels, which the city and the Archdiocese of Los Angeles are named after. Despite the long walks in high heels on streets paved with cobblestones… and the cold and rainy Easter Sunday Mass with the Pope (one of three Masses and six events with the Pope)… despite standing in some long lines to enter basilicas that house the remains of martyrs and saints… and the little “inconveniences” of any pilgrimage, this was a very blessed trip! I returned invigorated and more aware than ever that with privilege comes responsibility. I also confirmed that any place is a good place to evangelize! God and religion just seem to come up often in the life of an evangelizing Catholic. Truth is: people are willing to talk about their beliefs and questions more often than we think. Take Rafa and Ana: tourist-pilgrims from Spain with whom I spoke for over an hour outside of St. Peter’s Basilica, after meeting them on a bus on our way back from the Good Friday Stations of the Cross with the Pope. Take my rather personal conversation with a fallen away Catholic from the Dominican Republic, Jacqueline, on the train ride to Assisi. Or my conversation with Iliana at Piazza Navona on Divine Mercy Sunday, amidst the hustle and bustle of artists and tourists, vendors and visitors. After my friends and I had finished praying a Divine Mercy Chaplet, I simply leaned over to her and said with a smile: “I prayed for you.” I don’t know why I did that! Or maybe I do: because she was there, sitting right next to me on the plaza’s fountain guard rail… my neighbor. That simple evangelistic gesture led her to share that her 40 year-old friend Marco was just diagnosed with a brain tumor. She was devastated at the prospect of losing yet another loved one, less than two years after her mother passed away. She shared how she had stopped going to Mass, and was disappointed at not having her children baptized and a previous marriage annulled. She thanked me for praying for her – and for Marco. I could never have guessed where that one simple prayer and gesture would lead us! But the Lord knew. Each of these intelligent, “quasi-practicing Catholics” had questions and doubts, issues and problems… but they were willing to talk about God, Church, and faith. I was blessed to have met them and to have shared with them a word of encouragement, while lovingly challenging them to make an effort to understand more fully God’s plan for their lives in the Church He founded. I pray that my evangelistic encounters bear fruit. I pray that the graces I received on this trip may produce a rich harvest in my own life and ministry. And I pray that all Catholics grow accustomed to sharing their faith with whomever the Lord puts in our path – at home or abroad, in our native tongue or in broken English, Spanish, Italian, or sign language! 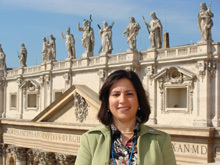 Martha Fernández-Sardina is the Director of the Office for Evangelization of the Archdiocese of San Antonio, and a national bilingual speaker, trainer, ministry consultant, and translator. She hosts a TV show and a radio show, authors a newspaper column, and blogs periodically (www.archsa.org/Evangelization).